Harvard University Press, 9780674726833, 457pp. 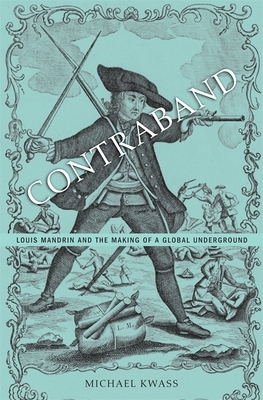 Louis Mandrin led a gang of bandits who brazenly smuggled contraband into eighteenth-century France. Michael Kwass brings new life to the legend of this Gallic Robin Hood and the thriving underworld he helped to create. Decades before the storming of the Bastille, surging world trade excited a revolution in consumption that transformed the French kingdom. Contraband exposes the dark side of this early phase of globalization, revealing hidden connections between illicit commerce, criminality, and popular revolt. France's economic system was tailor-made for an enterprising outlaw like Mandrin. As French subjects began to crave colonial products, Louis XIV lined the royal coffers by imposing a state monopoly on tobacco from America and an embargo on brilliantly colored calico cloth from India. Vigorous black markets arose through which traffickers fed these exotic goods to eager French consumers. Flouting the law with unparalleled panache, Mandrin captured widespread public attention to become a symbol of a defiant underground. This furtive economy generated violent clashes between gangs of smugglers and customs agents in the borderlands. Eventually, Mandrin was captured by French troops and put to death in a brutal public execution intended to demonstrate the king's absolute authority. But the spectacle only cemented Mandrin's status as a rebel folk hero in an age of mounting discontent. Amid cycles of underground rebellion and agonizing penal repression, the memory of Mandrin inspired ordinary subjects and Enlightenment philosophers alike to challenge royal power and forge a movement for radical political change.